A sentence is long as a piece of string. So I’m going to get a tattoo. Which is weird, because I don’t even like tattoos. But I heard about this project and immediately it seemed to fit. First off, it’s a semi-colon. It’s punctuation. There can’t be many folks alive who love punctuation as much as I do. But second, and more importantly, it’s a sign that you’ve survived depression. It’s a sign, in my case, that I’ve survived a suicide attempt, and you can read about that here if you’d like to (because, as people keep pointing out to me, I am very, very open about these things). What it means is: you could have ended your sentence. But you chose not to. Or, in my case, my own ineptitude stopped me from ending my sentence… But, hey, I was sixteen. What did I know? Very little (although, natch, I thought I knew everything). After a bit of debate on Facebook I’ve decided where to have it, too. On the back of my neck, at the top of my spine. This means, of course, I’ll only be able to see it in the mirror. But this makes sense, because… one of the other things I survived was an episode, ten years ago, when I hated my face so intensely I couldn’t leave the house. I had to go live with my parents. We had to cover all the mirrors up, or take them down, and the ones that were fixed to the bathroom cabinets had to be opened at such an angle that they couldn’t be looked in. Does this make me sound weird? I suppose it does. It’s not something I’m proud of. It happened, though, and since I’m a product of everything – good and bad – that’s happened to me since the second I burst, splat, from my mum’s womb, plastering the walls with blood (so I’m told), I can’t see the point in denying these things. I felt I didn’t have a face. I didn’t feel I existed. This made life difficult. I was just extremely ill, as I’ve been ill before and possibly (although every day I guard against that as well I can) will be again. But my sentence hasn’t ended yet. Virginia Woolf wrote one that was 199 words long. A sentence is long as a piece of string. I feel unhappy, writing this. Things haven’t gone my way and, yeah, I’m sad. But my grasp on punctuation is as solid as ever. I can really rock a dependent clause. 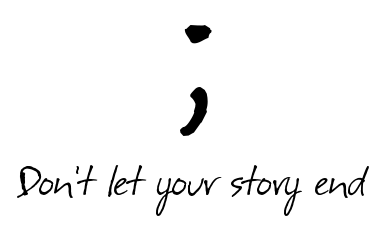 So I’m going to get a semi-colon on my neck because I want to celebrate the fact I’m still alive. I’ve fucked up 99% of things in my life, but I stuck around long enough to have the world’s best daughter and, maybe I’m kidding myself, but I genuinely think I do some good in the world these days. I’m glad I didn’t die. And I promise my next post will be about writing. If I hadn’t been so clueless, I wouldn’t be here today. The only reason I’m still alive is that, rather than gobbling a handful of pills in one go, I took each individually: thirty-five paracetamol and five of my Dad’s blue pills (for his bad back… this was 1989 and Viagra was but a glint in a drug rep’s eye). All this swallowing took enough time that my stomach rebelled and disgorged quite a lot of its contents before I could fall asleep. I was sixteen years old at the time. And, yes, you have read this correctly. I once attempted suicide. Anyway, not that you need me to tell you this, but it’s horrible. Having your stomach pumped is horrible. As I said, this was 1989. I’m not sure what it’s like these days, for an over-dosee, but back then they dumped you with everyone else in the general medical ward. You weren’t terribly popular either. You’d made extra work for the doctors and nurses. You didn’t know you were born, and what did you have to be sad about anyway? Your whole life was ahead of you. That, of course, was the problem. That is the problem, when you’re really sick. A whole life is ahead of you. And what if it’s all as horrendous as this little bit of it? If this was a story you’d call it far fetched, but a boy from my school was wheeled in, later that night, having taken an overdose of aspirin after a row with his girlfriend (his ears ringing tinnily because of it, which is one of the consequences). Amazingly enough, he suggested I get into bed with him. (Of all the places I’ve ever been hit on, etc etc.) I declined. This whole time, although nobody told me, they still didn’t know if I’d live or I’d die. Paracetamol has that effect: once the damage is done, then it’s done. But the thing is, you see, I did wake up. I didn’t die. I was glad to wake up; I had come to my senses. It wasn’t too late, for me, and I want to say STOP if you’re thinking of ending your life. Stop and think. Stay alive for another five minutes, then five after that. There are good things ahead of you. Honestly. I promise. A porter came whistling in while I lay in that hospital bed, and he stood a vase of daffodils on my bedside table, and he didn’t say anything but he smiled at me. A whistling man, a smile, a vase of daffodils. That’s all it takes, sometimes. If this blog post can be somebody’s vase of daffodils – yours, maybe – then I’m glad I wrote it.